What are the signs of an anaphylactic reaction? How do I avoid anaphylaxis? How should I treat anaphylaxis? Anaphylaxis is a serious, potentially life-threatening allergic reaction. The entire body can be affected within five minutes to an hour of being exposed. Sometimes, up to 12 hours after the initial reaction, a second anaphylactic reaction (or a biphasic reaction) can occur. By nature, anaphylaxis is unpredictable and can sometimes occur without an identifiable trigger. If you or a loved one suffer from food allergies, it is crucial to consult with an allergist to discuss avoidance and the best treatments for your reactions. Anaphylaxis symptoms occur suddenly and can progress quickly. If you have suffered from an allergic reaction in the past, small or large, you are at risk for severe reactions in the future. Individuals with asthma and a food allergy are also at risk for more severe reactions. 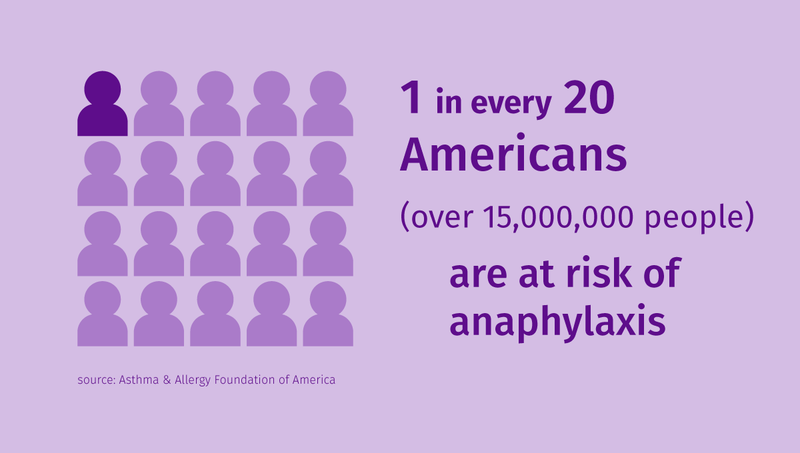 Anaphylaxis affects up to 1 in 20 Americans. That’s 15,000,000 people at risk of anaphylaxis! Children and teenagers are at an even higher risk with 1 in 13 being affected. 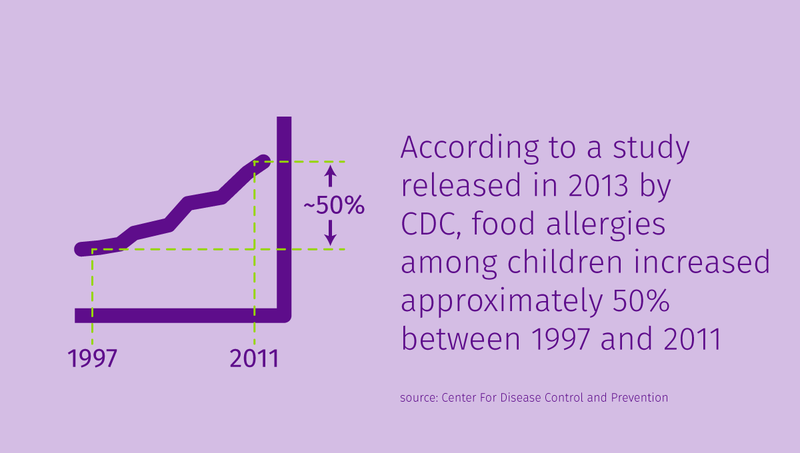 Amongst children, food allergies have increased by 50% between the years 1997 and 2011. Anaphylaxis is potentially life threatening. If you suspect you or someone you’re with is suffering from an anaphylactic reaction, administer epinephrine and call 9-1-1. Those at risk of anaphylaxis should avoid their diagnosed triggers: food, insect stings, medicine or latex. Anaphylaxis should be treated immediately with injections of epinephrine. Epinephrine is highly effective in halting the progression of anaphylaxis and acts quickly to relax the body and stimulate the heartbeat. In order to be effective, it must be administered promptly. Even if epinephrine is administered quickly and symptoms subside, the victim of the reaction should always call 9-1-1 and seek medical attention for further evaluation from professionals. It is also recommended to follow up with an allergy specialist. If you think you are having an allergic reaction, immediately use your epinephrine injector and call 911. The most common misconception is antihistamine will halt an anaphylactic reaction. The only treatment for anaphylaxis is epinephrine, administered via an auto-injector. 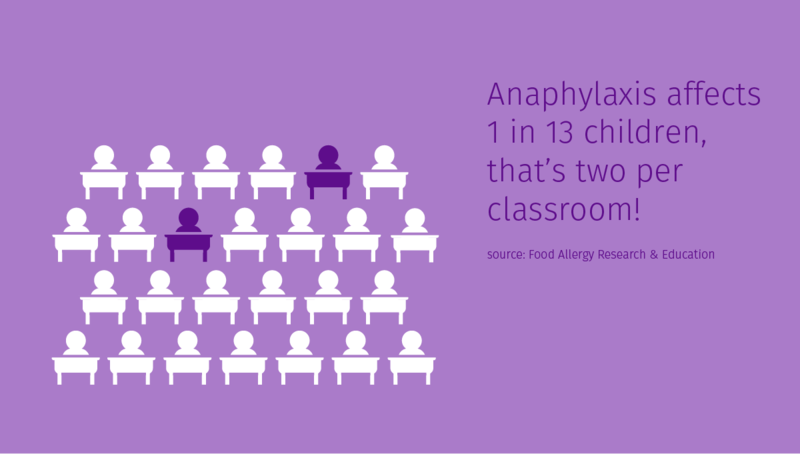 Early action is critical to successful treatment of anaphylaxis! Anaphylaxis usually happens 5 to 30 minutes after you come in contact with one of your allergy triggers. But in rare cases, symptoms don’t start until more than an hour later. You may have seen a movie scene where an actor’s face balloons or tongue dramatically swells, and an allergic reaction is obvious. But real life is not the movies. You may have indigestion, or difficulty breathing. Or you may have trouble swallowing, or “clammy” skin. Or hives. You may feel like something really bad is happening (feeling of doom). Since anaphylaxis affects more than one organ, a combination of these symptoms should cause quick action–injection with epinephrine and call 9-1-1.